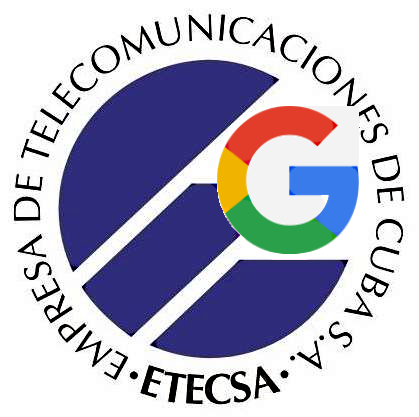 There have been rumors this week that Google was about to announce some sort of deal in Cuba and I had speculated (wished really) that they might be collaborating with ETECSA, Cuba's government telecommunication monopoly, in their forthcoming fiber trial in Havana -- hopefully leading eventually to a city-wide fiber backbone. That wish may not be granted, but it seems a big deal is in the offing. The Associated Press reports that on Monday Eric Schmidt will be in Havana to sign a deal bringing Google Global Cache to Cuba. The AP post does not reveal any details -- I guess we will have to wait till Monday for that -- but if Eric Schmidt is travelling to Havana for the announcement, my guess is that Google's content and services will be cached on ETECSA servers in Cuba. I've speculated earlier on the possibility of Google investing in a Cuban data center and this would be the first such investment. If Google content and services are cached on the Island, Cubans will see improved performance and it will reduce the load on the undersea cable connecting Cuba to the Internet. Multiple caches within Cuba could reduce the load on their national backbone as well. I don't know if Google will be covering the cost of the project or not, but even if they don't, Cuba will be getting access to and training on state of the art technology. That would be more valuable than the cost of servers. (It would be cool if Cuban universities were involved in the project). Google will also win. If Google performance improves significantly, they will gain users who click on ads and use services like YouTube, Google Plus, Google Drive and Gmail. These payoffs would not come for some time, but eventually change will come to Cuba. (And, I'd love to see a country -- even a small one -- in which Google Plus was more popular than Facebook). Chinese companies have dominated the Cuban infrastructure market to date and Huawei is a partner in the aforementioned fiber trial. 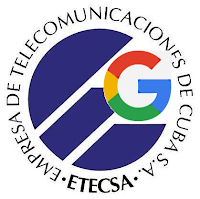 If Google collaborates with ETECSA in content delivery and data center infrastructure, it will establish them as a business partner, gaining them a seat at the table when other Cuban infrastructure -- like a fiber backbone in Havana -- is planned and procured. It would also be good publicity for Google and a win for the US administration and President Obama's legacy. Trump says he wants to renegotiate "the deal" with Cuba, but if this Google/ETECSA partnership materializes, Google will be added to the list of US airlines, telephone companies, hotel chains, cruise lines, etc. 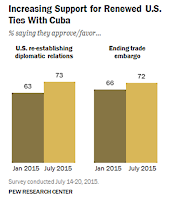 who have begun doing business in Cuba under the terms of the current "deal." We will know more on Monday, but I hope the AP report turns out to be accurate. We are seeing pushes by Cuba and by the US to close business deals before Trump becomes president. 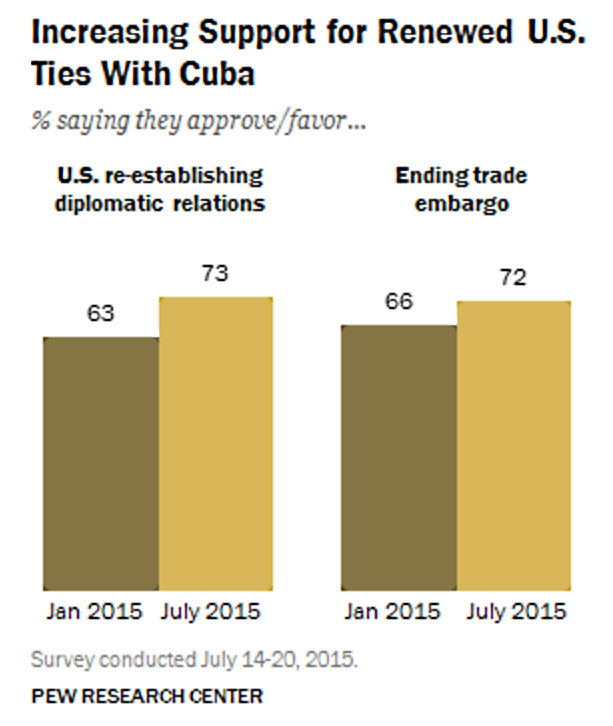 It is hard to imagine Trump -- a business man -- killing business deals when the majority of Americans favor more liberal relations with Cuba. 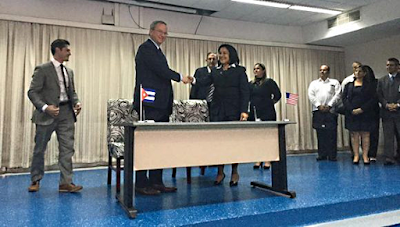 The deal has been signed -- Google Executive Chairman Eric Schmidt and ETECSA Executive President Mayra Arevich Marín announced that Google Global Cache will be coming to Cuba. Eric Schmidt and Mayra Arevich Marín.Foto: Oscar Figueredo Reinaldo/ Cubadebate. No details have been released, but I've been told by a friend that Google's content will in fact be cached in Cuba. Google has an interactive map of Global Cache servers around the world, but for now, it shows no servers in Cuba. 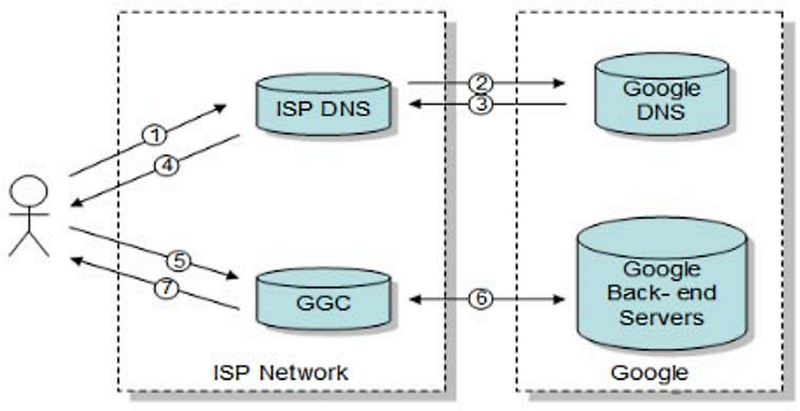 Google network engineer Mike Axelrod gave a presentation on the working and advantages of Google Global Cache at an Internet Society conference in 2008. He estimates a 20% latency improvement over slow links when content is cached within the ISP network (ETECSA in this case), but that will depend upon many factors. I do not know when the system will go live, but the impact will be minimal at first because of other congestion points in the Cuban Internet. But that is short term. The real significance of this deal is the acceptance and inclusion of Google as a vendor, a willingness of Cuba to begin moving to modern technology and one more relationship that helps lock in the political progress of the last two years. (Armando Camacho has translated a portion of Axelrod's presentation into to Spanish in long comment on a post on his blog). It has been reported that this project was done at Google's expense. Chinese companies have also supported Cuban Internet projects with below-market loans or grants. The U.S.-Cuba Trade and Economic Council reports that the Google Global Cache project is being paid for by Google and will cost the government of Cuba nothing. That is not surprising since Google will gain public visibility and their services will improve. More important, it establishes a business relationship with ETECSA and the cost is a drop in their bucket -- much less even than the cost of selling themselves to the Cuban government has been. People’s Republic of China-based companies have and continue to provide (either at no cost or with long-term favorable financing backed by the government of the People’s Republic of China) telecommunications and communications infrastructure and consumer communication devices to the Republic of Cuba. That is more surprising since Chinese companies, especially Huawei are selling a lot of phones, installing a lot of infrastructure and already have business relationships with Cuba. China was also involved in the installation, and some say financing, of the undersea cable connecting Cuba to the Internet. This post reminds me of a Wikileak from 2010 in which it was disclosed that Cuba was having trouble repaying Chinese debt. Blogger Mario Felix Lleonart has raised an interesting question -- will the presence of Google servers in Cuba facilitate surveillance and censorship? (His post in English is here). My initial reaction was that it will not because ETECSA has the ability to monitor and control all traffic going to Google servers whether they are on or off the island. That being said, having the servers inside ETECSA's network would make surveillance faster just as it would make watching YouTube videos faster so they might be able to afford to do more. I also realize that I have only a very simple understanding of Google's caching algorithm. For example, if someone does an "in:anywhere" search in Gmail, will that cause the contents of all of their Gmail folders to be cached in Cuba? And, if it does, does the Cuban government have a right to see that data? If so, in what form will it be delivered? Could they be compelled to turn over all of someone's email history in clear text? Would the government have access to Google's machine learning technology for surveillance? The devil is in the details and there are a lot of details here. We do not know what the legal and technical arrangements are between Google and Cuba or any other nation in which Google caching servers are located. Doug Madory reports that Google Global Cache is now online in Cuba. If you are in Cuba, let me know if it makes a significant speed difference. I've heard from a few folks that YouTube videos are faster since GCC went live and others saying they have not noticed any change. Once things are cached, speed should surely improve. I would also expect that Gmail and Google Drive performance would improve. The most recent updates I've received from Cuba indicate that Google's caching servers are still not being accessed by users. 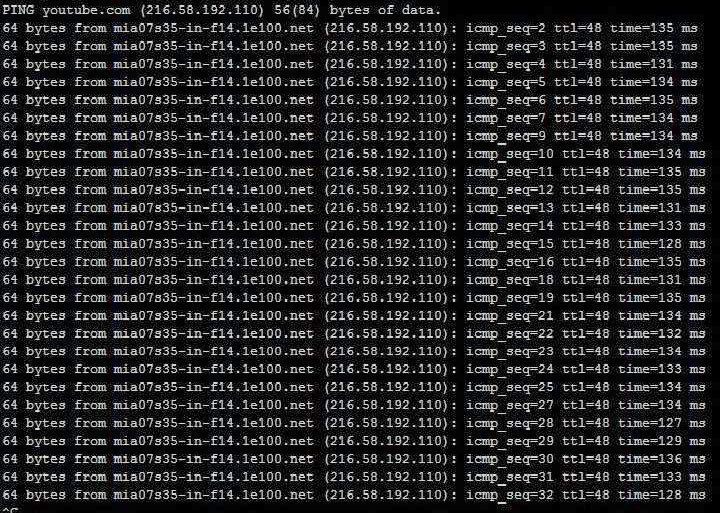 Pings and Traceroutes to YouTube.com are directed to hosts with domain names like "mia07s34-in-f78.1e100.net" and "mia07s35-in-f14.1e100.net" and I assume that "mia" in the names refers to Miami. 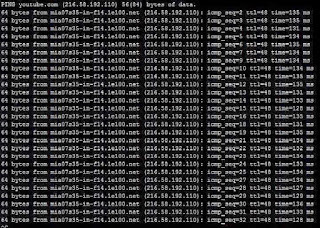 Furthermore, the ping times between 127 and 136 milliseconds, shown below, are too long to be to a server in an ETECSA data center. It will be interesting to see the effect of the local servers when they are in use and, more interesting, to see which Google services are cached. 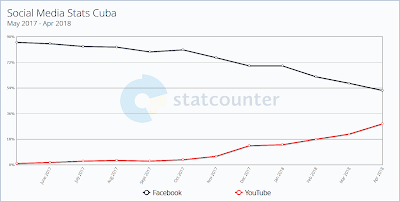 Facebook dominates Internet use in Cuba and many nations where connectivity is slow and expensive, but as you see here, YouTube has made substantial gains in recent months according to Statcounter. 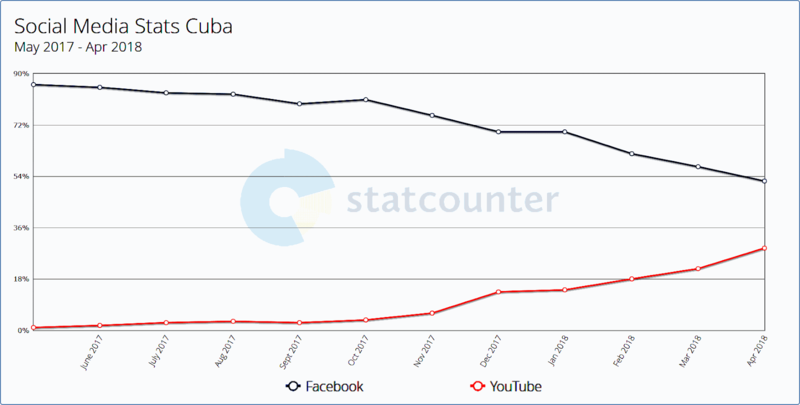 The upward trend for YouTube began at the end of April 2017, when Google Global Cache (GCC) went live in Cuba. (Other social networks that Statcounter tracks -- Pinterest, Twitter, Google Plus, LinkedIn, and Instagram -- remained fairly flat during the period, so most of YouTube's gain was at Facebook's expense). It would be interesting to know what Cubans are watching on Youtube -- I bet a lot of it is music videos. I also wonder if Cuban's are posting more video on YouTube. Regardless, Cuba allowing Google to cache content in an ETECSA data center has made a difference and it would not have been possible without Google's lengthy, concerted effort to establish relationships in Cuba.